Dinesh is reading Gandhi in Braille! 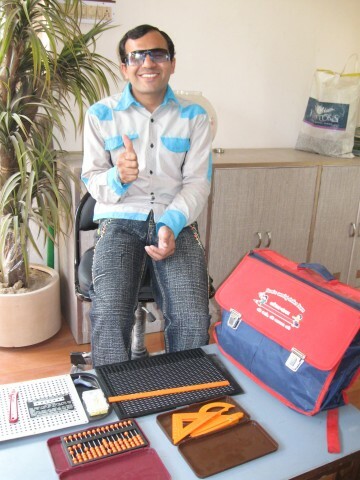 Dinesh with his new Braille kit! “I love to read Gandhi,” Dinesh says, smiling. “I love to go to English class and read short stories, but Gandhi’s writing is my favorite.” Dinesh reads Gandhi in Braille, a language he had never heard of before coming to the Blind People’s Association nine years ago. Prior to a very generous donation by James, Dinesh had to use a shared Braille kit, limiting the time he was able to study. Dinesh was born blind in one eye and sighted in the other. Hearing there was a temple that could cure their son’s bad eye, Dinesh’s parents brought him to the temple when he was thirteen. The “healing” ritual ceremony involved flushing Dinesh’s eyes with lemon juice. After the ceremony he was blind in both eyes. Thirteen year-old Dinesh could no longer walk down the street alone. He thought he would never read again. When his parents heard about the Blind People’s Association, they sent Dinesh to study at BPA, hoping an education would help lift his depression. Now, nine years later, Dinesh has a dream: to give the gift of education to other blind people. After graduation this year, he will pursue a Bachelors of Education to become a teacher. And there is one writer he is sure to include on his syllabus: Mahatma Gandhi. Click here to donate a braille kit!